We’ve only been friends for just about two months and Crème Ancienne is already making my ‘hero’ list. And if I had any musical talent, I would pen a song about its flawless formula. With a consistency of a delicious whipped desert, the Crème is lotion-light but with moisturizing capabilities of the richest cream. Its lightness makes it suitable for all skin types, and it’s taken me from last of the hot summer days to almost-sub-zero temperatures today. Its key ingredient is Meadowfoam Seed Oil, a fatty acid and powerful antioxidant similar to Jojoba Oil. Echinacea extract protects the skin from environmental aggressors and Chamomile wax leaves the skin soft and supple. 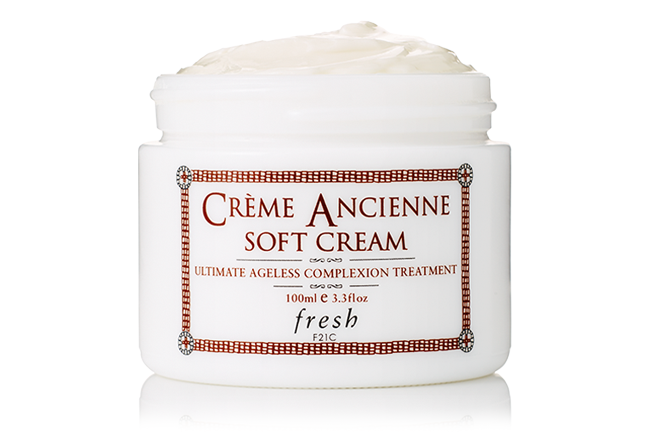 Crème Ancienne was inspired by the first cold cream, originally concocted in 2nd century by Claudius Galenus, a medical scientist and doctor to the Emperor Marcus Aurelius. If this cream is anything to go by, I’m sure latter day Roman royals must have had some soft, baby complexions. And maybe they sang about it, too. $164/30ml and $328/100ml at Sephora.